Well I’ve been fairly productive over the last few weeks. I’ve completed four (yes count them!) projects! That’s got to be a record for me. The first one is this rather snazzy (imho) waistcoat for Jamie’s prom. The story goes like this…. Jamie really wanted a red waistcoat. We hunted all the usual shops (River Island, M&S etc) but all we could find were black or grey. Then we tried a wedding outfitters. Lots of lovely red waistcoats there but they wanted – wait for it – £60!! Neither of us could justify paying that sort of money for something he’s likely only to wear once. So, to cut a short story short, Jamie suggested that the lovely red fabric I’d picked up on sale in Lee Mill a few weeks earlier would make a very nice waistcoat. 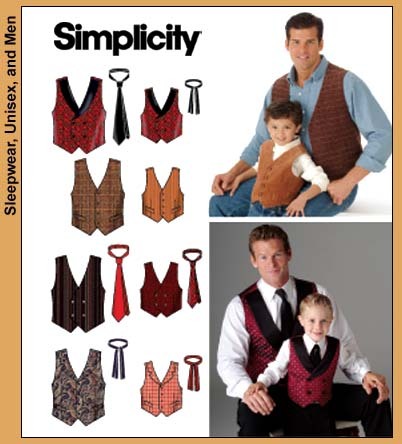 I used Simplicity 4762 – a lovely easy pattern which also included matching tie. Next up was this little shirred top for Chloe. I didn’t use a pattern for this. I simply measured her chest and multiplied by 1.5. Then, I stitched the side seam to form a tube and finished the top and bottom hems using the rolled-hem function on the overlocker. Using a long stitch and firmly-wound shirring elastic in the bobbin, on the wrong side of the fabric, I stitched corkscrew style until I reached the desired depth of shirring. For security I added a little halter tie, but it could quite easily be worn without (by the way, the fabric is the pink Laura Ashley I picked up for a snip in Butterfly Fabrics). My last two projects don’t have pictures yet. I’ll keep them for my next post.